The year is coming to an end and thus it’s a good time to reflect on things. An ending means often that something new is ahead and it’s a good excuse to make a change in our lives and do things better. Every year we have this thing called ”the New Year’s resolution”. It’s the stereotype of occasion to commit to something or some sort of self-improvement. Because sometimes all you need is a fresh start. Stop doing what you did or how you did it and start over again. But what does it really take to learn from last year’s resolutions and try to not turn 2016 in another year of false hopes and promises? If you really want to change, you have to take the time to sit down and reflect on things. If you don’t do this properly you will not get to the very reason why things didn’t work out in the first place and you’ll likely repeat the same errors. Write down the goals or things you wanted to improve and reflect on WHY it didn’t work out as you hoped for. The key point here is not to write down a hundred excuses. Sure, there are always a million reasons, most of the times the usual ones (too tired, too busy), but try hard to find the 1 or 2 specific reasons that were a deal breaker. If you can’t find the deal breaker, then you probably haven’t tried hard enough or it was simply not that important to you. Once you have your deal breaker, start brainstorming about solutions to prevent it to happen again. Most of the times things don’t work because we think we know how they should work or how the end result should look like. We set a goal and commit to a certain path, but if things don’t work out as expected we just stop walking instead of searching for another route. What happens in the very moment we put down our goals? We project ourselves into the future, and thus we obviously hope for the best, shooting generally very high. It’s understandable that we want to be optimistic for our future; it’s not the right moment to be humble and shy. If we are ambitious and if our goals are somewhat almost unachievable, we feel challenged and get excited by the sheer thought of actually achieving it! The thought of committing to something “small” and “easy” doesn’t sound interesting to us and we don’t feel challenged enough. The reality, however, is often quite different. If your goals are too ambitious, it’s likely that you will fail very quickly and by mid February you’re in the same old routine as if nothing ever happened. Every goal has to be broken down into little steps, and these steps HAVE TO BE realistic, doable and humble! Instead of shooting too high and into the blue you have to master the little steps, and they will eventually get you up there. A problem is grand in science if it lies before us unsolved and we see some way for us to make some headway into it. I would advise you to take even simpler, or as you say, humbler, problems until you find some you can really solve easily, no matter how trivial. You will get the pleasure of success, and of helping your fellow man, even if it is only to answer a question in the mind of a colleague less able than you. You must not take away from yourself these pleasures because you have some erroneous idea of what is worthwhile. If you lose the pleasure of “success” and the feeling of achieving something, even if little, or if you lose the feeling that you are able to contribute and play an important role in whatever you do, you will get lost. It’s the small pleasures and the small achievements that will motivate you every time to take the next step. Therefore it’s completely fine to change route along the way, because that means you’re learning. You have to learn from every step and iterate in order to find the right way that works for you. Finding the right way means finding your perfect habit loop. As mentioned before, you probably have to practise or do something over a longer period of time, and in order to do so you have to turn it into a habit. 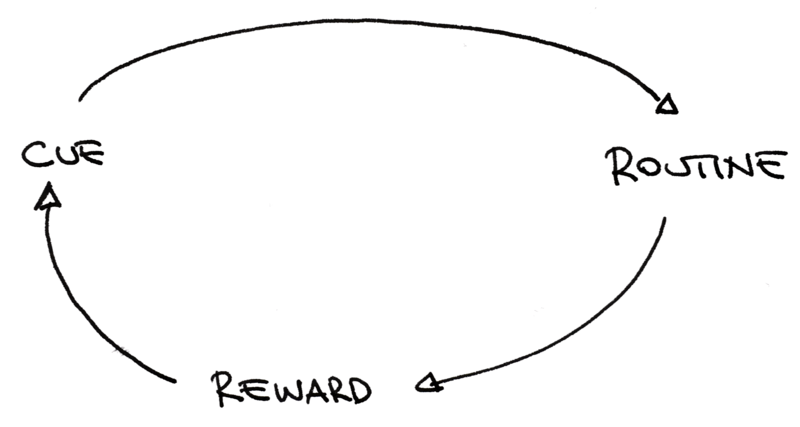 Turning something into a habit means creating a loop made of a cue, a routine and a reward. If you want to establish a new habit you have to make it as easy as possible for you to remind yourself and to start the new routine. You will also have to consider to plan, especially at the beginning, exciting rewards that celebrate the progress you’re making. 3) you have to believe in it. This may sound cheesy, but studies have shown that a successful implementation of a habit comes from believing in it. Taking advantage of a group spirit or sharing your goals with others so that you’re accountable for it are good ways to get additional support. And now we’re essentially back to the beginning: an almost unachievable goal will not strengthen your belief that you can do it. It’s the small thing that you change, the little amount of time that you spend every day over a longer period of time that will eventually lead you to success. We really hope we inspired and encouraged you in choosing this New Year’s resolutions.